Measles was declared eliminated from the United States in 2000, but anti-vaccination beliefs may be playing a role in bringing the disease back, a new government report suggests. The Centers for Disease Control and Prevention investigated more than a decade's worth of data on measles cases (including 2013 cases through the end of August) and found that most patients had not been vaccinated. Measles is a respiratory disease caused by a virus, that spreads through breathing, coughing and sneezing and causes a serious rash and fever. While measles is harder to come by in the United States, the CDC notes it's still a worldwide public health problem that can be brought over to the country and spread to Americans. Measles can also result in serious complications including ear infections, pneumonia, and brain swelling -- or encephalitis, which occurs in about one out of every 1,000 cases and may lead to death, Dr. Roya Samuels, a pediatrician at Cohen Children's Medical Center of New York in New Hyde Park, N.Y., told CBSNews.com in an email. One CDC expert pointed out that a measles infection can linger for four hours even after the infected person is no longer in the vicinity. "Clusters of people with like-minded beliefs leading them to forgo vaccines can leave them susceptible to outbreaks when measles is imported from elsewhere," Dr. Anne Schuchat, director of the National Center for Immunization and Respiratory Diseases, told reporters Thursday during a teleconference. "This is an extraordinarily contagious virus." Such clusters included people with similar religions, those with extended large extended families or even certain school districts where vaccine rates are low. So far this year, 159 cases of measles were reported in 16 states, with three outbreaks accounting for most of cases: outbreaks in New York City (58 cases), North Carolina (23 cases) and Texas (21 cases). That's on track for the most cases since measles was considered eliminated. Fortunately, said Schuchat, nobody has died. Eighty-two percent of cases were in unvaccinated persons, and 9 percent were in people who weren't sure if they'd been vaccinated. Seventy-nine percent of those the unvaccinated cited philosophical differences with the measles mumps and rubella (MMR) shot. The CDC said recent misinformation about the measles vaccine -- including a since-disputed link to developing autism from vaccines -- may still be influencing some families. Schuchat called on pediatricians and doctors who have close relationships with these families to convince them otherwise. In recent years, some pediatricians have even fired patients if parents won't get their kids vaccinated, citing risks of infecting other kidsin their practices. The new measles report coincides with a CDC release of a national report card of vaccines in infants aged 19 to 35 months. This year marks the 20th anniversary of legislation that created the Vaccines For Children Program, a federally-funded effort to provide no-cost vaccines to kids whose families can't pay. The program was first launched to combat a national measles crisis in the late 1980s, Schuchat explained, when a vaccination gap was evident in preschoolers who would get turned away from pediatricians because parents could not afford shots, only to be referred to a community health clinic where the families might not show up. For the report card, almost 17,000 families were surveyed by random phone calls, then the CDC checked back with the children's' doctors to confirm whether they indeed had been vaccinated. Overall, U.S. vaccine rates remain high outside of these pocketed clusters. 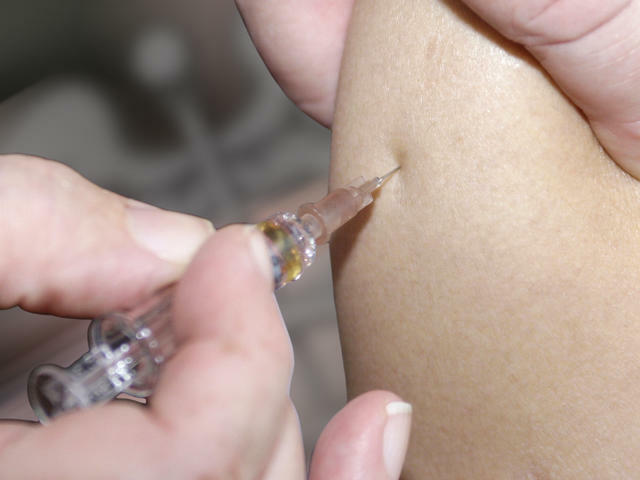 About 90 percent of those surveyed got the recommended vaccines such as the measles (MMR), polio, pertussis (whooping cough), hepatitis B and varicella, or chicken pox shots. Texas is currently battling a whooping cough epidemic, with two deaths reported in infants too young to be vaccinated. There were differences among states: Fifteen states had vaccine estimates below the 90 percent coverage suggested as part of the government's Healthy People 2020 goal to increase coverage by the end of the decade. Schuchat emphasized infants too young to be vaccinated may be vulnerable in these areas if someone comes over from another country infected with measles. Eleven thousand babies are born each day in the U.S., she noted, and the only way they are protected is if adults and children around them are vaccinated. Interestingly, she said, about half of imported measles cases the CDC found came from Europe. "They're literally a plane ride away," she warned. Both CDC reports, on measles and vaccine rates, were published Sept. 12 in the agency's journal, Morbidity and Mortality Weekly Report.